Unfortunately BetVictor has made the decision to remove the Best Bet Wins promotion for the foreseeable future. We will keep you updated about this competition. The removal of the offer has not affected BetVictor's #priceitup market therefore these markets will still be available to bet on and request. 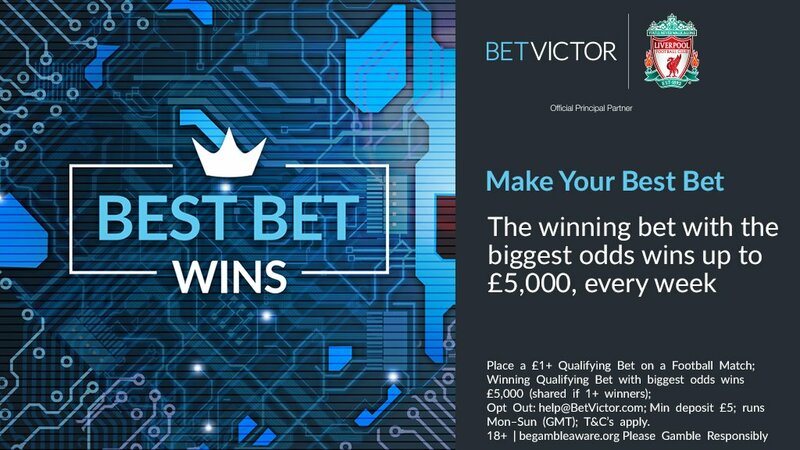 For the 2018-19 new football season BetVictor have kept with their theme of running cash prize competitions with their new #BestBetWins weekly promotion. Each week the highest odds £1+ bet placed on any market within a football match will win £5000 in cash. Best Bet Wins is a leaderboard based competition that will typically run on a weekly basis during the football season. It has started in time for the first round of Premier League games and has replaced “Golden Goal”, which the operator has been running for the last two seasons. Best Bet Wins will work in the same way as the operator’s World Cup campaign, The Million Pound Bet, with the punter who selects a winning single bet with the longest odds during the week. To participate, you simply need to register at BetVictor and place a single bet of at least £1 stake on any market within a football match. if it wins and has the biggest odds by the end of the qualifying period you’ll get an extra £5,000 added to your winnings. The #BestBetWins page also offers templates for #PriceItUp bets that can be made to show prospective bettors how to build up their odds and get their names on the leaderboard. May the Best Bet Win! Only betting markets that belong to a football fixtures will count for the competition; including in-play bets placed on a fixture. Any bets on Outright markets or Specials will not qualify for the competition. In addition, £5,000 in Casino bonus funds will be shared each week by those customers occupying a top 50 position on the weekly leaderboard. Don't you know how to open a new account at BetVictor? Click this special link, get an amazing welcome bonus today! To win the Weekly Competition, during the Weekly Competition Period, a Customer must have a settled Winning Bet with the Biggest Odds of all Qualifying Bets. The winner(s) will be the Customer(s) who is in first (1st) place position on the Leaderboard after all Qualifying Bets have been settled following the conclusion of that Weekly Competition Period. The prize available for winning the Weekly Competition shall be determined by BetVictor at the time of publishing the competition, but shall typically be Five Thousand Pounds Sterling (£5,000) (the Weekly Prize). To win a Special Competition, during the Special Competition Period, a Customer must have a settled Winning Bet with the Biggest Odds of all Qualifying Bets placed on the Fixtures to which that Special Competition applied. The prize available for each Special Competition will be determined by BetVictor at the time the competition is published and shall be specified within the Special Leaderboard area. The Customer Terms (which are accessible here) apply to the Customer’s participating in the Competitions. In the event of any conflict between the Customer Terms and these Terms, the Customer Terms shall apply. A Customer participating in the Competitions acknowledges and accepts that betting odds fluctuate for numerous reasons and understands and accepts that it may be possible for identical bets to be placed at different odds, due to price fluctuations that occur and that an identical Outcome may be offered within different Qualifying Markets and at different odds. BetVictor, at its sole discretion, reserves the right to discontinue offering the Competition at any stage after the end of the relevant Competition Period. "BetVictor #BestBetWins Competition Is No Longer Available"